If you know artists who fit the above criteria, then the Tékumel Foundation wants to hear from you. Send us their names and contact information and we will follow up. New cover art for The Man of Gold? The Tékumel Foundation is planning on re-releasing The Man of Gold later this year, and we’re interested in your ideas for cover art. 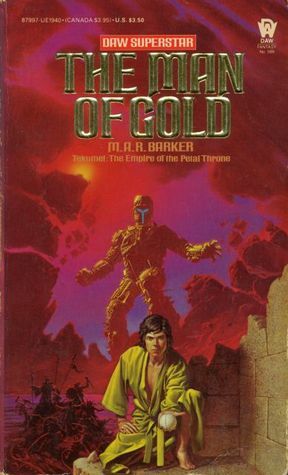 Michael Whelan’s original cover for The Man of Gold, Professor Barker’s novel published originally by DAW Books, is a gorgeous work of art that unfortunately has very little to do with the actual story. We think a new cover for the new edition ought to have something to do with the story and the world of Tékumel. What do YOU think? Tell us your ideas for the new cover art for The Man of Gold. We will carefully consider all of the suggestions in choosing what will appear on the cover of the new release. Let us know what you think would make the best cover!